Zoya Nail Polish presents three new mattes for summer 2011. The incredible Zoya modmattes LE* shade collection has been expanded with three new LIMITED EDITION beauties. Get all of the color, none of shine with modmattes LE*, Zoya’s exclusive blend resulting in utterly wearable and truly stylish matte nail polish. 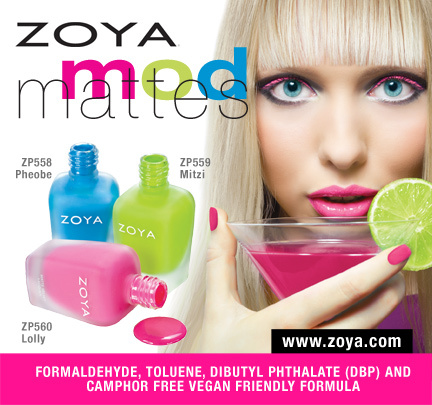 Zoya Nail Polishes are free of harmful industrial chemicals like toluene, camphor, formaldehyde, formaldehyde resin, dibutyl phthalate (DBP) that are known to cause cancer and birth defects. Find Zoya modmattes LE* as well as over 300 other ultra high-fashion Zoya shades at www.zoya.com. As always, each and every Zoya color is made for women so we name them after women. Get the news on the newest Zoya Promo on VampyVarnish! This was information provided from the manufacturer.